Bulino means in Italian burin, or graver. When engravers talk about bulino technique, it usually means engraving pretty (small scale) pictures. This technique came from Italian engravers and they create truly amazing works of art with this, and they don’t use any power tools, just one graver and small 10x loupe. Works from masters like G. Pedersoli or Firmo Fracassi are so well made, that you’d think it is photo. One customer ordered a Zippo with engraved picture on it. 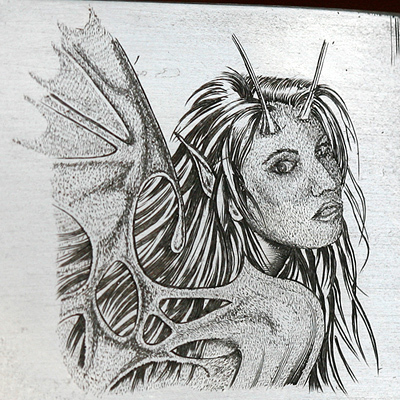 As I have never done any bulino work before, I took the hardest part from that picture, a facial part of that woman, and engraved it about 3x bigger than it will be on Zippo. 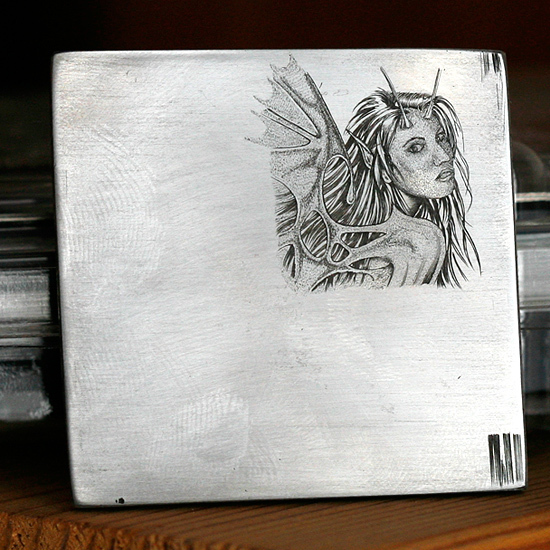 Here is my first finished practice plate with bulino engraving. As you can see, more practice is needed.